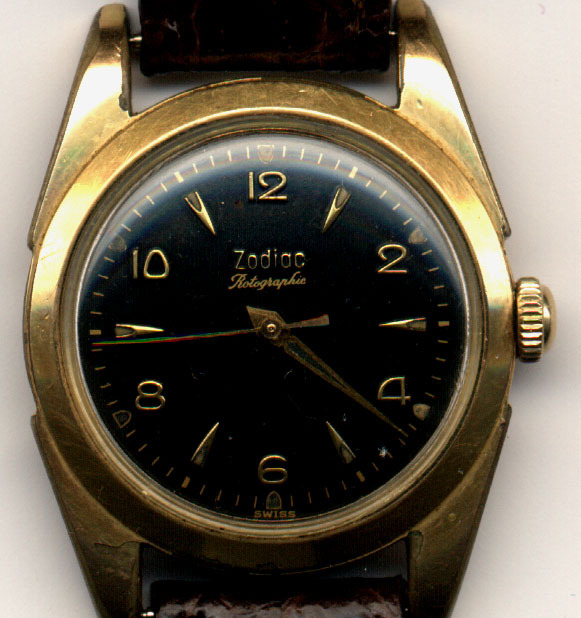 THIS IS A ZODIAC ROTOGRAPHIC WITH A BLACK DIAL AND GOLD RAISED NUMBERS AND INDICATORS.IT HAS SOME DISCOLORATION ON THE CASE BUT IT IS NOT DISTRACTING. 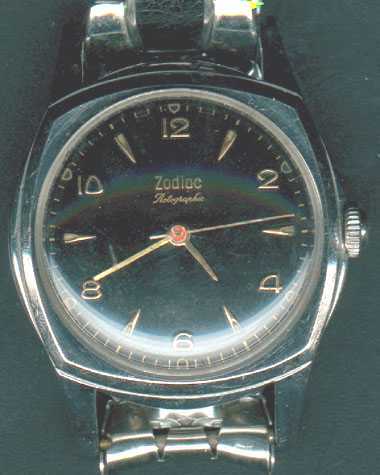 Here is a beautiful, good condition, perfectly running, stainless steel, automatic, Zodiac Rotographic automatic. 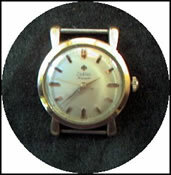 34mm in diameter. 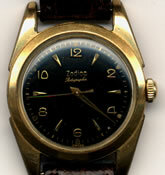 Superb, champagne colored evenly aged original dial with gold applied numbers and markers. Sweep second. Stainless steel case back. Crystal is near perfect and a quick buffing will make it that way. After market metal bracelet, Jubilee Style, that makes this watch look like a high priced R---x (I was told I can't use that brand name in making comparisons!). 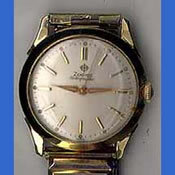 This watch positively looks great!!! Signed crown. The movement is at least 17 jewels but I haven't unscrewed the screw back to look. Perfect runner.